The view from inside an apartment at One Water Street. It's the classic bait and switch. PMC Property Group is trying to get out of providing several affordable housing units it promised in exchange for the city letting them to build the apartment complex One Water Street higher than would normally be allowed. Inga Saffron, The Philadelphia Inquirer's Pulitzer Prize-winning architecture critic, was the first to report on PMC's devious moves and has been all over the story since then. According to her reporting, PMC was allowed to build the 16-story One Water Street next to the Ben Franklin Bridge 48 feet taller than normally permitted because they promised to provide 25 units at subsidized rates. But as One Water prepares to welcome its first tenants, it seems unlikely any low-income renters will ever get to enjoy the stunning river views. The developer wants out of the deal. The problem, of course, is that One Water Street can't exactly return the five extra floors it's already built. PMC's executive vice president, Jonathan Stavin, declined to discuss the company's decision to renege on its affordable-housing obligation, but two city officials confirmed the builder was in talks to substitute another public amenity in place of the subsidized units. Among the proposals: public art. For context, the apartments at One Water Street aren't exactly bargains to begin with. A one-bedroom is $1795 a month. A family of four looking for a 3-bedroom place will pay a rate of $5525. PMC is going with the alternate proposal route, Saffron wrote in her column Saturday. It's trying to get another permit by instead providing a a 5,000-square-foot retail space, a piece of public art, and an energy-saving system. While that could pass L&I because it would make up for the added feet under the city's zoning bonus system, it would likely irritate community leaders, Saffron notes. 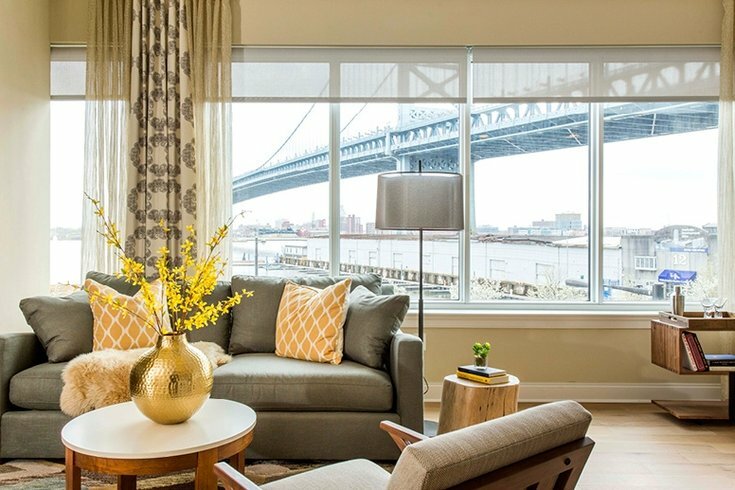 Even with the subsidy, a one-bedroom unit at PMC Property Group's One Water Street, next to the Ben Franklin Bridge, is expected to rent for $942, about half what market-rate tenants will pay in the same building. That's the same as an apartment in a less-expensive neighborhood near Passyunk Avenue or Northern Liberties, so you wonder whom this will help. Again, Saffron has been all over this story, and you can read her latest column here.